With busy lives pet owners could be putting their animals at risk of serious health problems? 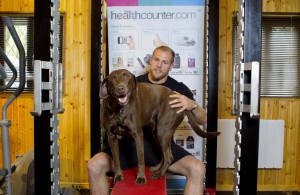 England & Wasps rugby player James Haskell and TV vet Luke Gamble have joined forces to support the ‘It’s a Jungle Out There’ campaign to educate pet owners on the importance of making sure their pets are being given regular parasite protection treatments against sometimes fatal parasites. New research shows that only half of pet owners regularly get their pets treated with parasite prevention treatments, while one in five don’t bother at all, with around 40% admitting they forget to administer parasite prevention treatment. Although most owners know that they need to regularly use parasite protection for their pet in order to keep them happy and healthy, it is often difficult to remember when and how frequently to do so. And while some parasites such as fleas and ticks may not be fatal, other more deadly types such as the lungworm Angiostrongylus vasorum can be fatal to dogs, which has experts urging pet owners to take the matter of parasite protection seriously and administer preventative treatments regularly. To help pet owners the ‘It’s a Jungle Out There’ programme has launched a FREE app for pet owners, offering a bespoke parasite treatment reminder service. Once downloaded, users can create a pet profile to keep track of all their pets information in one place, including breed details, microchip number, weight, and date of birth of their dogs, cats, rabbits and ferrets. A ‘learn’ section of the app is also available to provide owners with the latest information on parasites and the risk they pose to pets and family members. The Jungle for Pets app launches on the 9th September and is initially available to download for iPhones and iPads, by searching ‘Jungle for Pets’ in the Apple App store. This entry was posted in Health and tagged pet health, travel, vets by admin. Bookmark the permalink.